To Die For, is the story of Meg Wyatt, pledged forever as the best friend to Anne Boleyn since their childhoods on neighboring manors in Kent. When Anne's star begins to ascend, of course she takes her best friend Meg along for the ride. Life in the court of Henry VIII is thrilling at first, but as Anne's favor rises and falls, so does Meg's. And though she's pledged her loyalty to Anne no matter what the test, Meg just might lose her greatest love--and her own life--because of it. Though much of Meg's story is fictionalized, it is drawn from known facts. The Wyatt family and the Boleyn family were neighbors and friends, and perhaps even distant cousins. Meg's brother, Thomas Wyatt, wooed Anne Boleyn and ultimately came very close to the axe blade for it. Two Wyatt sisters attended Anne at her death, and at her death, she gave one of them her jeweled prayer book--Meg. 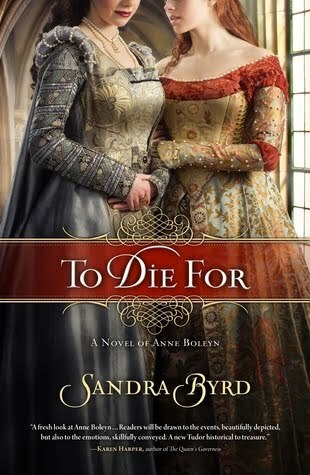 Although the novel To Die For by Sandra Byrd is a novel about Anne Boleyn, it is told through the first person narrative of Meg Wyatt, her friend, and true historical personage. From their early youth to Anne’s final moments, Meg tells the story of this fascinating queen’s life, from its fabulous rise to its tremendous fall. Sandra Byrd did a wonderful job at writing a well researched story. The writing flowed seamlessly and drew me into the story from first to last page. I was impressed because she skillfully weaved political fact and Reformation details throughout with such ease, and so simply, that it was not obtrusive or confusing in the least. I especially appreciated the fact that there just enough characters for me to follow and remember as I read along. To Die For is the first book in a new series entitled The Ladies in Waiting Series. I hope that future books in the series will branch out beyond the over-done Tudors. With plenty of intrigue and twists and turns, this is an all-around, multi-dimensional novel with plenty to keep one reading to the end.